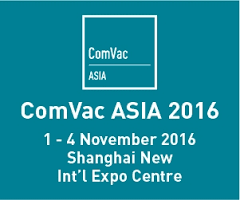 Peak Gas Generation will be exhibiting at ComVac Asia, in Shanghai between the 1st - 4th of November. ComVac Asia is widely considered to be China’s premier exhibition for the compressor and air technologies industries. This year the event will be held in the Shanghai New International Expo Center and the Peak China team will be showcasing our latest innovative technologies, in the form of the i-Flow 6022 nitrogen gas generator, in Hall E7, booth D5-4. i-Flow 6000 series nitrogen generators are an ideal solution for manufacturing & processing industries and are capable of producing ultra-high purity nitrogen gas, suitable for use in numerous applications such as blanketing, food packaging, heat treatments, laser cutting, 3D printing, metal or plastic extrusion and many more. They are modular & scalable, meaning each generator can be expanded to meet growing future demands and offers customers a cost effective, economical, future proof and sustainable onsite alternative to bulk liquid or gas supply methods. Want to learn more about how Peak Gas Generation's products & services? Why not come visit us in Hall E7, booth D5-4 and find out how we can help your company maximize its productivity.